shot from last weekend. It’s so crisp and clean looking to me. I think this shot would look really nice on a ‘big cloud’ or stormy day. As some of you have already guessed, there will be a BARN page coming soon. 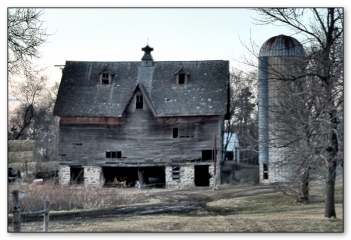 We’ll set up a barn photo section for some good (and maybe not so good) barn shots. The goal will be to combine barns or other old buildings with at least one other element of interest to see if we can get some super photos. I was so busy looking at barns, I forgot about this shot. It was snowing quite heavily this evening, so I thought I’d try some long exposure shots to try to catch the snow. The falling snow doesn’t show up, but I think the neighborhood looks like it’s in a winter mood. This is another shot that can act as a reminder of what type of shots can be taken when the sun isn’t up. While this photo is of no interest other than the method that was used to take it, it can be used as a good reminder that some interesting photos can be taken on mild late winter nights during or after a fresh snow. Especially architecture type shots of interesting buildings or city shots with lights. Options galore.